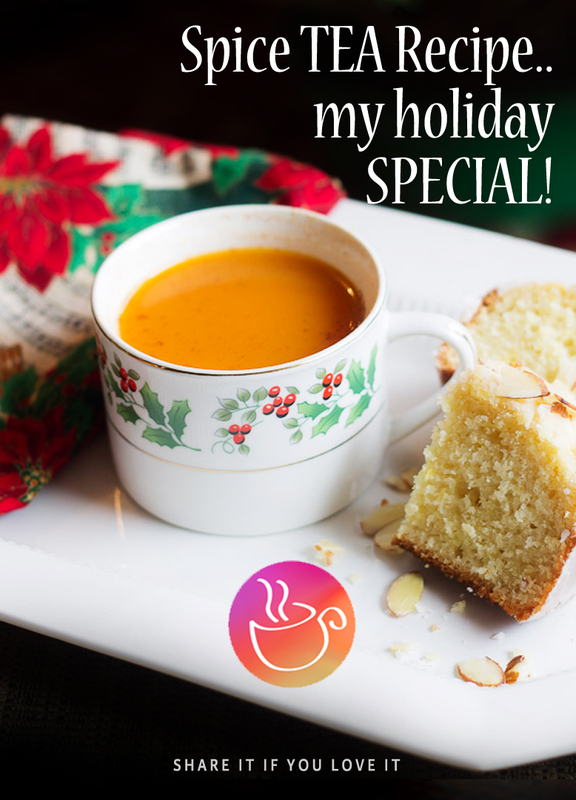 RECIPE: Spice TEA, My Holiday Special! Make some memories this Christmas with my special tea recipe for the holidays. It has the aromas of cinnamon, clove and lemon, mingled with hot fruit juices and fine Bourbon. This tea tastes like Christmas in a cup. It is citrusy, sweet and spicy. Boil water with the spices for 5 mins and remove from heat. Add tea to pre-boiled water, cover and steep for another 5 minutes. On the side, heat juices together in a saucepan and bring to boil, stirring occasionally. Now add the strained hot tea and heat the mixture together for another 2 mins. Remove from heat, squeeze the lemon juice, stir in honey and bourbon. Your special tea is ready…serve hot! Enjoy this tea by yourself, or make and share with your family and guests at holiday get-togethers. This entry was posted in Tea Cocktails, Tea Recipes and tagged Bourbon, Bourbon Tea, Christmas Tea Recipe, DIY Christmas Spice Tea, Russian Tea Orange, Russian Tea Pineapple, tea recipe, Tea Recipe Holidays. Bookmark the permalink. @LoveforTeaDelhi http://t.co/7a5mYJfVeF on #theneeds your work is now featured in #Recipes, view it & RT to spread the word! Thank you so much. I am glad you liked my recipe and appreciated my love for tea. Would love you to try it, it’s pretty simple and delicious. @LoveforTeaDelhi Hey there, cutie teacup, wanna dance? TOOOOT! @LoveforTeaDelhi that cup is a fantabulous cuppa! just love the colour!